This course has now been replaced with our award-winning three day course. Click here to find out more. When we are learning how to attract women in Ireland there are several principles which tend to work really well. These range from daygame techniques through to pick up artist principles and body language practices. 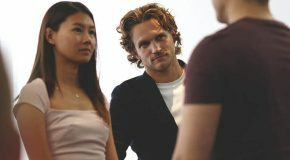 In this article I’m going to illuminate various principles which we teach on our pick up artist courses all over Europe. The key to using the following strategies effectively is to go out and test them out for yourself and see how you can implement some of the lessons into you normal daily activities. The most important principle which we teach on our daygame courses in known as proximity. Simply put when we want to start a new conversation with a girl, the very first step that we have to take is to get close enough to her to initiate a new conversation. On our pua training Dublin courses when clients are feeling anxious we simply get them used to getting proximity with attractive women. Once they are feeling comfortable in the vicinity of good looking girls, the next step is to start a new interaction. Having limited time when we meet new women serves to raise our value in the interaction. When we are genuinely in a rush to be somewhere it conveys so many positive attributes about ourselves; from having an exciting life through to being able to manage our time effectively. On our pua training courses we explain that by adding “I’ve only got a second.” to our initial contact allows women to relax more in our presence. They then know that we are not going to hang around for too long, which then allows them to get to know us on a more intimate level. On our award winning three day course we have enough time to spend with each of our clients to get to know them on a more intimate level. Time and again we find that our inner game is just as vital to our success with women as our outward principles, especially when we are learning how to get a girl to like you. The more relaxed we can become in the presence of women the more attractive we become as a man. When we are able to be completely unaffected by a women’s beauty this conveys so many alluring qualities. We then find that women are naturally drawn into our wold rather than actively looking to meet new girls. The biggest principle which we teach on our dating coach courses is how to overcome approach anxiety. This is a fear that pretty well all men face when we have the prospect of approaching new women who we find physically attractive. We explain on our pick up artist Dublin courses that there are several ways to overcome our approach anxiety. One of the most significant ways is to act within 2 seconds of seeing a girl we like. When we have a solid structure to follow we find that our minds focus on our blueprint and not on our anxiety; meaning we can now approach new women without fear. Once we start meeting and attracting new women the next step is to improve our pua text game strategy. In a nutshell the more fun we can have when texting women the more likely it is that they will want to meet up with us again. Experience has taught us that we are far more likely to meet up with girls again when we invite them to an event or a social engagement which we are already attending. The lower level the investment it is for the girl the more likely she will come along. Want To Attract More Women? Hey Buddy!, I found this information for you: "Pua Training Dublin – Using Daygame Principles To Attract Women". Here is the website link: https://www.socialattraction.co.uk/pua-training-dublin/. Thank you.